In Los Angeles, picking up an eighth of weed at a dispensary these days is as easy as buying beer from the corner store. While it may have taken California a while to get the ball rolling on recreational cannabis sales after voters passed Prop 64 in 2016, as of January 2018 any adult 21 and over with a driver’s license or valid ID can legally buy pot. Gone are the days of charade doctor appointments where you’d feign sweaty palms, body aches, or nightmares of that creepy rabbit guy from Donnie Darko to gain a weed card as dispensary doors are open to both medical patients and recreational users alike. The process is now as simple as: Choose a dispensary licensed for “adult use”—the California verbiage for “recreational”—and not just medical sales. Make sure you’ve brought cash as many don’t take cards, and nobody likes on-site ATM fees. Then shop around for your selection of buds, edibles, extracts or other cannabinoid products, and leave with them in a handy pinch-and-seal, child-proof bag. With hundreds of medical marijuana shops in town, where are the reliable (and legally operating) spots to pick up your 420 supplies? We’ve scoured Los Angeles to pick out our 10 favorite dispensaries for recreational cannabis shopping. MedMen is a far cry from the dingy, furtive shops of yore. Their well-lit, slickly designed stores are newcomer-friendly and will easily quell any initial weed shopping apprehension. 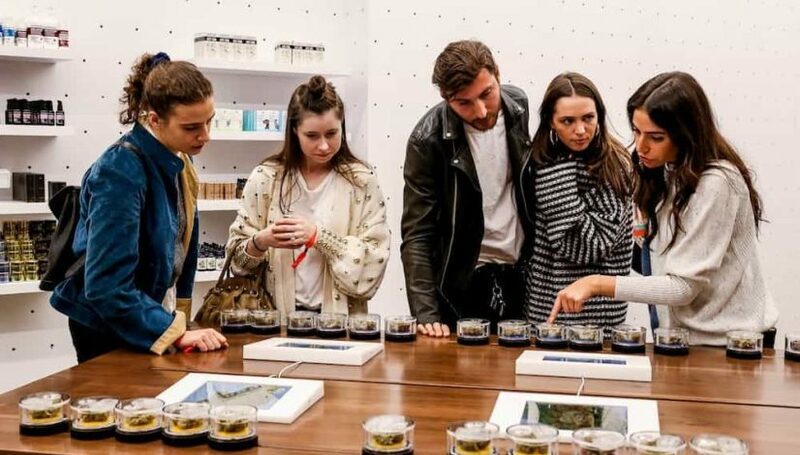 The franchise coins themselves as the “Apple store” of cannabis, a vibe that’s readily apparent in the roving, red-shirted sales associates, and display islands spaced throughout the shops. The accessible tablet-equipped counters display various strains coded by color, complete with a touchscreen that allows you to learn all about your potential purchases from Lord Jones THC gumdrops to Lowell Smokes’ organic cannabis pre-rolls. MedMen also offers a variety of edibles, vapes, luxurious and infused bath products, and pet products. You can’t miss City Compassionate Caregivers as it’s located in the Arts District on the ground floor of a huge building with their logo adorning the side like a bullseye. The sizable dispensary is clean, minimalist and neatly organized, with a wide selection of products, including edibles, concentrates, CBD-only products, and more. The stock of flower is presented in color-coded jars by indica and sativa strains. Of note here is The Cure Company flower, which is the bud being cultivated right upstairs. Purchase seeds if you’d like to grow your own—adults in the state can grow up to six plants per household. CCC will take care of state taxes for you on your first visit and, unlike many commercial spaces in LA, there’s parking. Follow the earthy goddess mural from Venice artist Hans Walor into the Green Goddess Collective, a warm and welcoming dispensary with natural wood floors, ambient light, and classic rock on the stereo. Enter down a long hallway where a receptionist will check you in, then advise you to head upstairs. The shop is small, so you might have to wait a few minutes, but staff is happy to help once you reach the front of the line and introduce to their lineup of oil, kief, hash, vapes, wax, balms, and tinctures. Be sure to come for “Goddess Hour” from 1-2 p.m. daily, for 15% off select eighths, then walk across the street to the beach and have yourself an afternoon. Navigate to Exhale Med Center through a small outdoor plaza to the friendly lobby decked out with fish tanks, then inside where you’ll meet some of the nicest dispensary staff members in LA headed up by budtender Chris Joynt. Exhale carries a wide selection, serving as the city’s flagship store for Bloom products and stocking other popular brands like Foria and Kiva. You’ll find a fair amount of CBD products and plenty of clones should you want to grow your own Banana Kush or Girl Scout Cookies. Customers are welcome to make use of the in-store rosin press to squeeze hash oil out of their newly purchased flower. The shop’s decor is simple and crisp and the laid-back vibes help to make buying cannabis seem as natural as stopping by the market for a bottle of red. Buds & Roses is one winsome shop with a lobby that’s soft and gray and a shop portion that has brushed wood floors and tidy displays. The check-in process is easy, and first-time visitors will receive a card that scores them 15% off their total. The selection here is very good with a wide selection of Terp Preservation Society resin along with plenty of concentrates and flower (the aromatic indica-dominant Chocolate Hashberry is a great find), plus clone starter plants for the aspiring cultivator and even some apparel. Though street parking can often be relatively easy in this area, they do offer complimentary valet parking. Located on a busy stretch of Cahuenga, MMD stands out with its leafy green exterior. After a brief check-in process in an upstairs lobby, guests will head a flight of stairs into the neat, wood-paneled shop. Reggae music plays and budtenders are quick to help. Flower from brands like Canndescent and Cream of the Crop is presented in clear, easy-to-read dishes with all the pertinent information, including prices, clearly displayed. Other cases show off glassware, edibles, concentrates, and, as a bonus, if you live or work in the area, you’ll score a 10% discount. Unlike dispensary-saturated West Hollywood, Central LA doesn’t have quite as many shops within close proximity. So, what Western Caregivers Alliance lacks in neighbors, it makes up for with free parking and an amicable, helpful staff. Peruse the Cannabis Periodic Table of Elements and jam out to some lively music in the lobby. Then see about their solid selection of over 40 strains and other cannabis products. If you’re a first-timer, you’ll get 4 grams in an eighth, as opposed to the usual 3.5 grams. Right off the 101 in Hollywood, The Kind Center has a wealth of ways you can choose your weed adventure, including glassware and plenty of cartridges. The shop also stays well-organized with a well-informed staff that’s happy to help. After checking in with the affable security guard in the lobby—which contains a Ms. PacMan game as well as helpful signs explaining California state taxes—you’ll head into the dispensary. First-timers are given a card that lets the budtender know to show them around the store to peruse popular products like their Cali Kush Farms bud and California Dab Company vape pens. Alternative Herbal Health Services’ co-owner “Dr. Dina” Browner isn’t exactly a doctor, but she did get her nickname from Snoop Dogg for her extensive cannabis knowledge—so, that’s pretty much a medical degree right? AHHSWEHO has been serving medical patients since 2004, the shop is small and pleasant, with street-facing windows for natural light and an easy check-in process. Though the selection is not as vast as other nearby WeHo outposts, they do carry a curated selection of fun products like Dosist vape pens and Netflix’s cannabis line. The TV-inspired strains served as a promotion for comedy series Disjointed, on which Browner was a consultant. The sense of relief from walking through the doors of New Amsterdam Naturals is the feeling of wisely getting the hell out of traffic on the 10 and, instead, entering a well-stocked oasis in the middle of that chaos. This shop is helmed by a friendly, knowledgeable staff welcoming to both recreation seekers and patients, whether you’re an expert or newcomers. Their product lineup includes medicinal oils, creams, and sprays that are just a few feet from creative edibles, inventive flower strains like Apple Fritter and Wedding Cake, out-of-market rarities from Washington’s Exotic Genetix, and loads of high-quality extracts and solvents. New Amsterdam Natural’s crown jewel is easily their huge collection of waxes with 340 on offer—by far the most on the Westside. The post The 10 Best Marijuana Dispensaries in Los Angeles appeared first on High Times.